Infectious disease already limited life expectancy in the early 20th century. But in the first year of the pandemic, life expectancy in the United States dropped by about 12 years. Most influenza outbreaks disproportionately kill juvenile, elderly, or already weakened patients but the 1918 pandemic predominantly killed previously healthy young adults. ^ "The Nation's Health". www.flu.gov. U.S. Department of Health & Human Services. Archived from the original on 2016-10-26. Retrieved 2016-03-31. ^ "Life expectancy in the USA, 1900–98". demog.berkeley.edu. Archived from the original on 2003-06-08. Retrieved 2016-03-31. 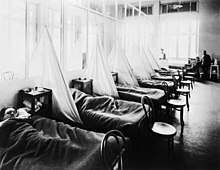 ^ "The Influenza Epidemic of 1918". Archives.gov. National Archives and Records Administration. Retrieved March 31, 2016. ^ Vergano, Dan (January 24, 2014). "1918 Flu Pandemic That Killed 50 Million Originated in China, Historians Say". National Geographic. Retrieved November 4, 2016. ^ Bynum B (March 14, 2009). "Stories of an influenza pandemic" (PDF). The Lancet. 373 (9667): 885–886. doi:10.1016/s0140-6736(09)60530-4. 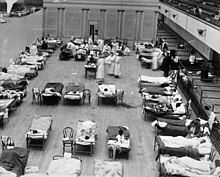 ^ "Bacterial Pneumonia Caused Most Deaths in 1918 Influenza Pandemic". National Institutes of Health. 2015-09-23. ^ a b Wishart, Skye (July–August 2018). "How the 1918 flu spread". New Zealand Geographic (152): 23. ^ Almond, Douglas (2006-08-01). 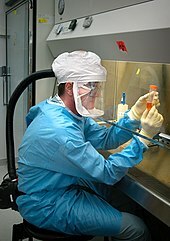 "Is the 1918 Influenza Pandemic Over? Long‐Term Effects of In Utero Influenza Exposure in the Post‐1940 U.S. Population". Journal of Political Economy. 114 (4): 672–712. doi:10.1086/507154. ISSN 0022-3808. Afkhami, Amir (29 March 2012) [15 December 2004]. "Influenza". In Yarshater, Ehsan. Encyclopædia Iranica. Fasc. 2. XIII (Online ed.). New York City: Bibliotheca Persica Press. pp. 140–143. Denoon, Donald (2004). "New Economic Orders: Land, Labour and Dependency". In Denoon, Donald. The Cambridge History of the Pacific Islanders. CUP. p. 247. ISBN 978-0-521-00354-4.